Most of .psd files can be openend in Gimp, but sometimes some strange and cryptic errors make it impossible. I tried a few other image viewers from the Ubuntu software center, without success. Eventually, I tried LibreOffice (former OpenOffice) and it worked like a charm ! Just launch LibreOffice Writer, open file, choose your .psd file and here it is ! 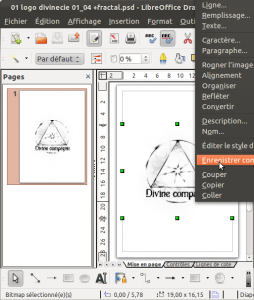 LibreOffice show your .psd as a flat file, all layers merged together. Now just right click on the displayed image and choose “Save as image…”. Now you can save your image as a .png file for example. Another option would be to try Faststone Image Viewer, Xnview, Acdsee… or Photoshop in Wine.